There is a chance you own an iPad or know someone who does. If you don’t, well, consider me your first iPad acquaintance. People are getting the digital tablet for different reasons, mostly for reading I suppose. I got mine to do finger drawing directly on the screen. So far, I’have been using a sketching app called Brushes. Above is one of my first sketches with it. The app also allows you to save the drawing and replay it as a movie, isn’t that cool? 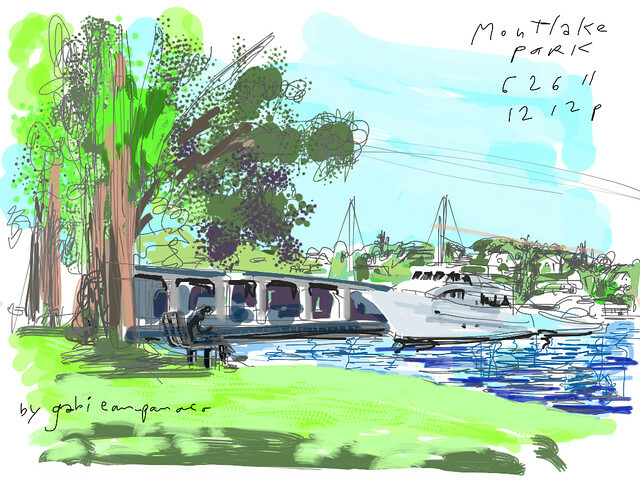 I did the sketch a couple of Sundays ago at West Montlake Park with the Seattle Urban Sketchers, the same day I sketched this kayaker.